chuckholmes March 29, 2019	 March 25, 2019	 Leave a Comment on Prospecting vs. Marketing: Which Strategy is Better? 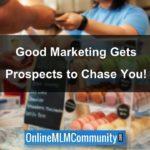 Today, I want to take a few moments and educate you about the difference between prospecting vs. marketing. If you own ANY type of business, you need a simple way to generate fresh leads for your business. Leads are theContinue reading… Prospecting vs. Marketing: Which Strategy is Better?